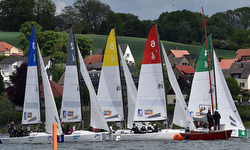 (Attendorn, Germany)- Over the past weekend, the Yacht-Club Lister, hosted the finale for the German J/70 Youth League on the Biggesee in Attendorn, Germany for twenty-two teams from across the country. Winning the finale was Flensburger SC, but winning the overall youth J/70 league series was Bayerischer YC 2 team. Going into the final regatta, it was going to be a battle for the top three spots. It was the BYC Team’s regatta to lose, based on their initial performances leading the fleet with a tally of 6-2-4 in the first three events. Nevertheless, it was Muncher YC’s strong youth crew that overcame a 10th in their first series to post a 1-5-2 to nearly topple their rivals from the top of the podium in the overall youth championship series. The MYC crew ended up in a tie for the series silver position with VS Wansee 1 Team on 18 pts each, with MYC winning the tie-breaker and VSW taking the bronze. Rounding out the podium were Bodensee YC Uberlingen in 4th with 22 pts and Flensburger SC in 5th for the series with 24 pts. For more German J/70 Youth League sailing information Add to Flipboard Magazine.